On Dec. 9, 1968, Douglas Engelbart delivered what is today known as “The Mother of All Demos” in San Francisco, unveiling to the public a revolutionary new computer system that consolidated many aspects of personal computing into one machine. Nearly 50 years later, composers and performers Mikel Rouse and Ben Neill have brought this watershed moment in technological history to the stage. On Wednesday night, the duo premiered a multimedia performing arts piece, simply titled “The Demo,” to a full house in Bing Concert Hall. Before the show began, Wiley Hausam, executive director of Stanford Live, delivered opening remarks explaining the 1968 demo’s significance. He noted that Engelbart’s presentation had shocked the world with the debut of the computer mouse and demonstrations of hypertext, windows, video conferencing and more. 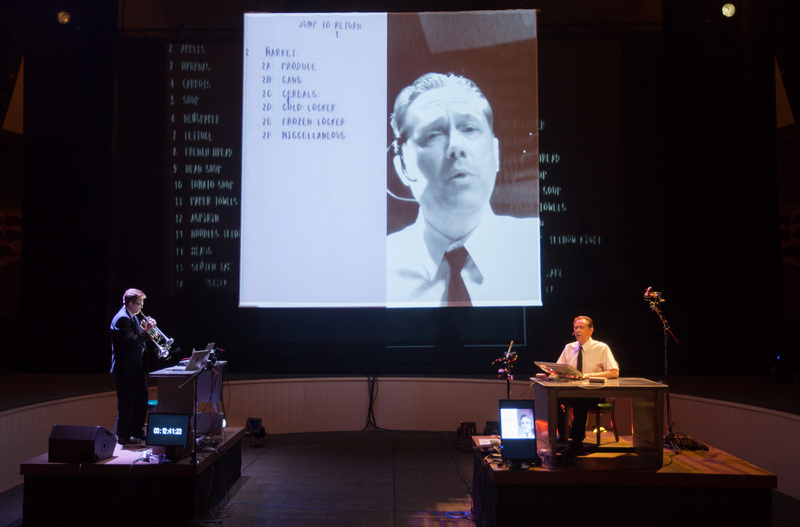 The performance began with a large video projection of Engelbart’s face — actual archival footage from the original demonstration — and as he spoke, the spotlight fell on Rouse, who deftly mimicked Engelbart’s every word and movement in full costume. 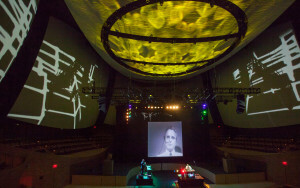 Neill, portraying Engelbart’s longtime partner William English, stood across the stage, manipulating two laptops and playing the mutantrumpet, a personal invention that combines three trumpets and a trombone with electronics to create a unique spectrum of sounds. 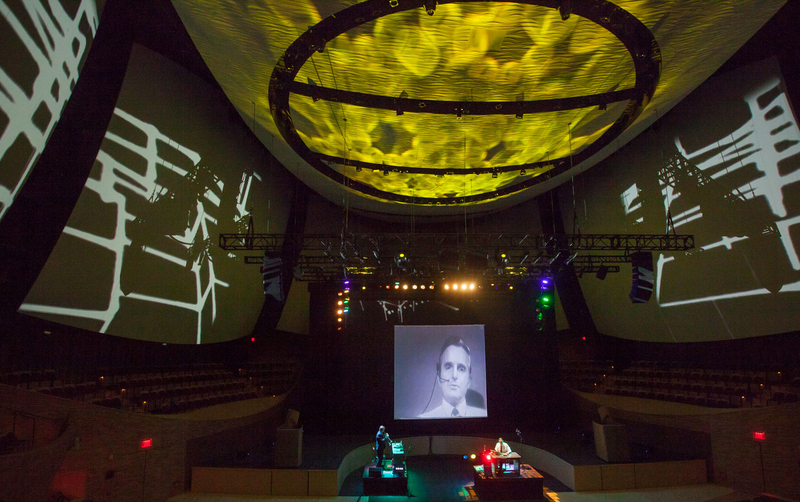 Behind the primary screen hung a semi-translucent partition which caught light features and projections, behind which stood a raised stage for a troupe of actors who portrayed Engelbart’s core team of assistants, who worked from Menlo Park during the 1968 demo. In the backdrop, more graphics were projected onto yet another screen. As Engelbart explained his team’s innovations on the main screen, his voice was overwhelmed by electronic beats and synthesized music coming from Neill’s instrumental set-up and Rouse’s singing. At times, the performers on the second stage served as a chorus. In fact, for most of the performance Engelbart’s explanations were drowned out by Neill’s and Rouse’s original score. 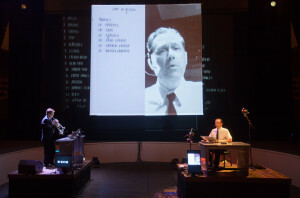 The primary screen often faded from Engelbart’s face to a live stream of Rouse, who continued to mimic the footage and intermittently sang Engelbart’s original words. Images of the monitor used in the 1968 demo displayed the historic innovations in action, just as Engelbart originally presented them. The superimposition of images along with the occasionally ominous music had an oddly haunting effect. In the context of a rather technical presentation, such flourishes felt noticeably out of place. At one moment the music made way for a pregnant pause in Engelbart’s demonstration, only to fall flat as another feature of the computer was explained in heavily technical terms — a disappointing climax, to be sure. The artful combination of music, acting and graphics consistently set the stage for a dramatic breakthrough, but never delivered. Instead the performance often created a sense of melodrama — unfulfilling, artificial climaxes defined a show that, at its core, had no apparent conflict to address. Throughout the 90 minute runtime, it was difficult to focus on any one aspect of the performance — there was so much going on at any given moment that my attention was scattered and strained. Still, the overall effect was both visually stunning and musically engaging, and the audio-visual interaction was powerfully immersive. The execution, the stagecraft, the light work and the music were all stunning in their own right, and together they created a marvelous spectacle. But unlike a play, the show did not revolve around any engaging drama; unlike a concert, the music did not center around an easily discernible melody. “The Demo” is a kaleidoscope of ideas, media and art expertly combined, but at its core it sorely lacks narrative interest. It’s a beautifully embellished re-enactment of a profound moment in human history, but in the end it’s perhaps too faithful to the original 1968 demonstration, which we must remember was a fundamentally dry technical presentation. With its multimedia prowess and masterful execution, “The Demo” had all the tools necessary to bring art to life in spectacular fashion. At many times it came close to succeeding, although only through the manipulation of stagecraft and not by dramatic content. In the end it lacked narrative substance, and these tremendous embellishments most often produced the unwanted effect of melodrama. It was a beautiful show and a well-deserved tribute to the work of Engelbart and his team, but all the same I left Bing decidedly unfulfilled.